Kirra Dune Revegetation – Queensland. 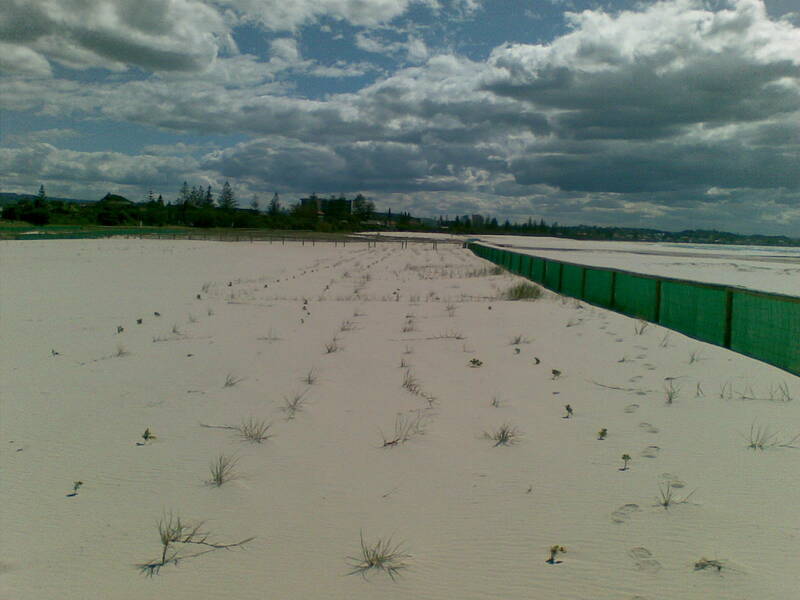 Posted on 21 June 2012 by emrprojects | Comments Off on Kirra Dune Revegetation – Queensland. 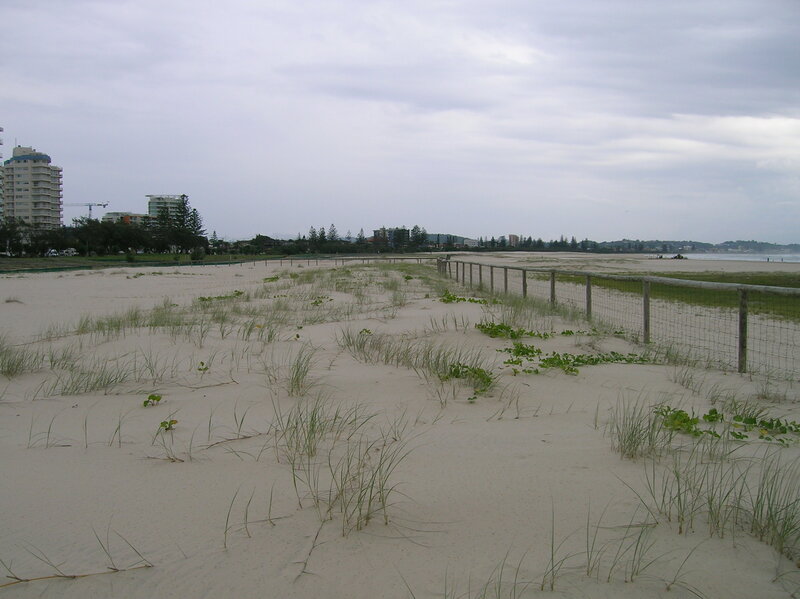 A project was developed in 2009 to remove sand from the intertidal area at Kirra to form a new series of dunes along a 1.5km stretch of beach from Kirra to Bilinga, on the far south coast of Queensland (Fig 1). While the purpose was to maintain the beach amenity and reinforce a buffer to the shoreline, the reconstruction of the dunes (to an average height of 4 metres and the width v from 25 to 60 metres) also involved reinstating native plant communities along the dunes for stabilisation and the conservation of biodiversity. Fig 1: Project area – 1.5km stretch of beach from Kirra to Bilinga, Queensland. 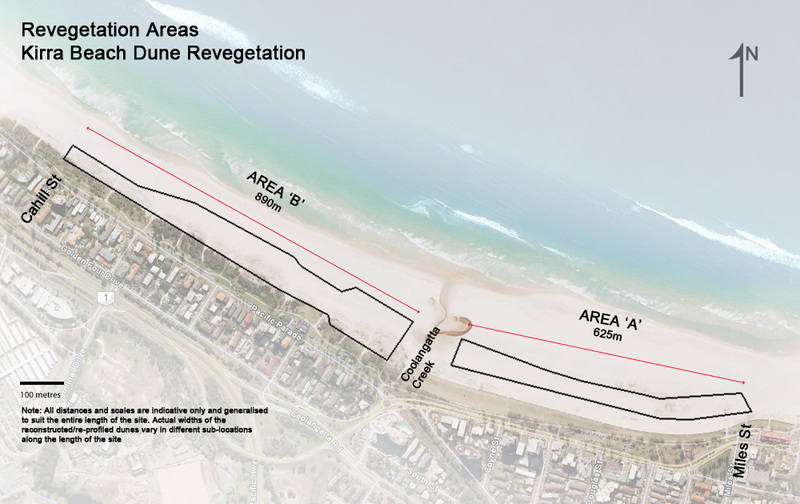 Revegetation was conducted in the frontal dune area of the project site and in strategically placed infill planting cells between the frontal dune and the existing vegetation landward edge of the project site (Fig 2). Four locally occurring dune species were selected: Spinifex (Spinifex hirsutus) 65%; Beach Bean (Canavalia rosea) 5%; Goats Foot Convolvulus (Ipomoea pes-caprae) 15%; and Vigna (Vigna marina) 15%. 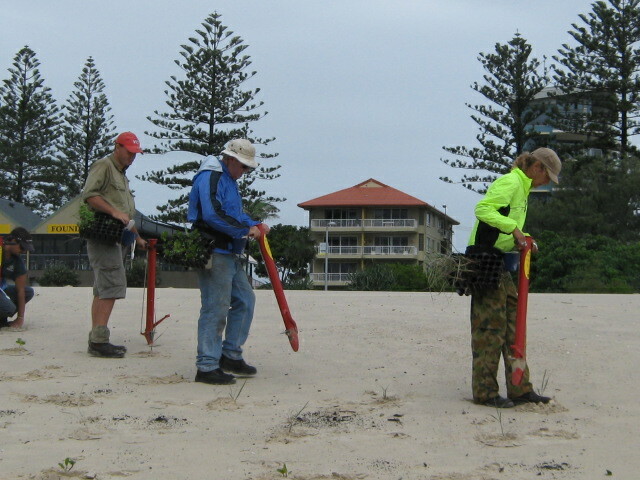 Fig 2: Revegetation of the dune system using infill planting cells and four locally occurring plant species (April 2011). For a 12 week period the plants were monitored and watered with a 25,000L capacity off-road truck, with plants replaced as required. The site was then maintained for a period of twelve months post-planting to promote good growth of installed plants, prevent weed incursion, ensure dune stability through increased native vegetation cover and assist natural regeneration of dune species. The total length of the planting area is 1515m and approximately 18,000 tubestock were planted out over an area of 18000m2 by a team of 6, who planted a total average of 4500 plants per day. Results. Planting survival rates varied mainly due to mobile sand and anthropogenic disturbance. Good rainfall over the installation period and for 4 weeks following planting ensured establishment was successful (Fig 3). At 12 months after the planting on the foredune, Beach Spinifex (Spinifex sericeus) densities are approaching, or in some areas have reached, densities expected for a naturally established frontal dune (Fig 4). Since planting, the nursery-spelled Beach Spinifex have flowered and seeded, however the bulk of the increase in biomass is due to extension of the runners. Beach Spinifex runners have travelled in all directions across the dune (i.e. including up inclines). Small swales of windswept sand can be seen captured in front of Beach Spinifex. Of the three species planted on the frontal dune, Beach Spinifex (overall) has shown the greatest increase in area covered. Fig 4: Revegetation of dune system 12 months after works (April 2012). (d) a combination of factors. Growth rate, however, was not a specific metric that influenced the decision to include these species in the revegetation species selection; the primary reason for their inclusion was to increase in situ species richness in the mid- to long term. Based on this, their inclusion has been successful. As mentioned previously they are now growing more rapidly and both species have flowered and produced seed. Runners are beginning to connect the infill planting cells with the frontal dune row plantings. In addition to the three species used in the frontal dune plantings, Beach Bean (Canavalia rosea) was also included. The establishment, growth and survivorship of Beach Bean has been similar to that of Vigna — a period where growth appeared minimal and then more rapid growth throughout summer 2011/2012. Overall survival rate is approximately 80%, however survival rate of individual plants is probably not the best measure of success for a project of this nature. Percentage cover or biomass is a more appropriate measure. Despite this, whichever measure of success is chosen the project has met and exceeded requirements. Plant abundance and vegetative cover are very good to excellent. Combined with the species composition (richness) many areas of the frontal dune are indistinguishable from a naturally occurring frontal dune. The plants are reproducing and increasing their abundance; at this point predominantly vegetatively (i.e. ‘runners’) however all species have produced seed and these could reasonably be expected to add to the plant population. The plants are well established and (in the absence of any extreme natural events or destruction by intent) self-sustaining. Lessons learned. Beach Spinifex (Spinifex sericeus) is a rapid colonizer of frontal dunes and was the first of the four planted species to reinforce a buffer for the newly created dunes. Anthropogenic disturbance through the planting establishment area. This resulted in breaking the ‘crust’ that forms on the top of semi-stable sand, making the underlying sand more susceptible to erosion. Sandblow that covers or undermines plants in the first few months post planting. Because the sand was “sterile” (due to it having been reclaimed from the intertidal zone and lacking a seed bank), weed invasion, up to this point, has been minimal. This may suggest that weeds predominantly recolonise natural dunes due to accumulated seeds and other propagules persistent in the sand. Stakeholders: The Department of Environment and Resource Management (DERM) has been responsible for the project management of the Kirra Beach Restoration Project. The Gold Coast City Council (GCCC) is a key stakeholder and the primary service provider for the works. This entry was posted in Coastal & marine, Erosion issues & solutions, Queensland, Standards, Techniques & methodology. Bookmark the permalink.